I'm from a little town in the middle of nowhere Pennsylvania. I lived in the far suburbs of a 3000 person town. The closest I got to graffiti was when "the guy with the knife" carved "I'm the creeper" into the bridge my father and we kids built across the little creek in the woods behind our house. The Guy with the Knife story is for another time, just let me tell you my mother finally called the State Police when this idiot kept walking around the woods in 95 degree August weather with his full ski mask on and boom box blaring. Oh, and because he was suspected of cutting down our tire swing and the rope ladder from our tree house. Hmm. Sounds like I got a little off topic. Anyway, I don't know any people that have ever put graffiti on anything. Actually, that's not true. One kid I knew climbed a street sign when I was in college in Ithaca to change the last letter of a popular street to match my last name. Same kid that got arrested for stealing a turtle crossing sign... coincidentally. Again, I digress. Basically, what I'm getting at is that I never heard of the famous graffiti artist Futura fka Futura 2000. He's been around for decades and YouTube is full of videos about and by him. 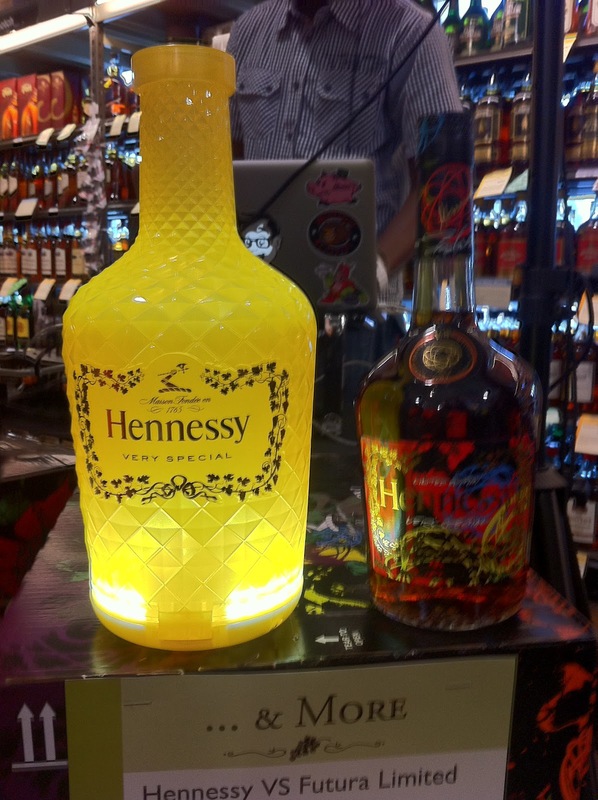 Apparently, his work caught the eye of Hennessy Cognac too. My gateway to this dude was the email blast list of Total Wine. One day a month or so ago I was told he'd be making an appearance in the North Miami store. Sounded cool. My cousin-in-law and I watched more than an hour of Futura's videos on YouTube to prepare. She decided that she'd go with me. "Arrive Early" pleaded the Total Wine email, so the plan was to meet 30 minutes prior to showtime. 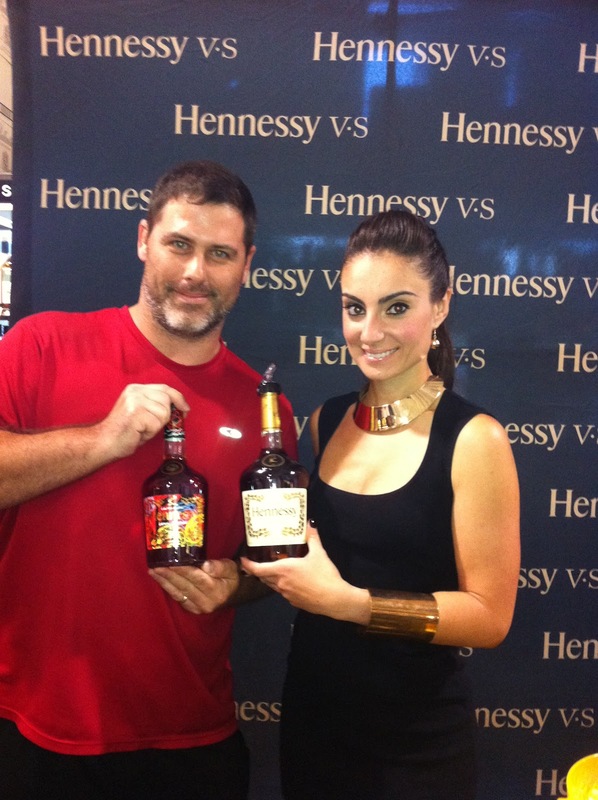 I arrived 28 minutes early, enough time to hang with the Hennessy models and take some photos prior to the event. One of the Total Wine employees told me where to go for the event and he pointed to an enormous man, saying I'd need to arm wrestle him for any autograph. So I approached said enormous man, told him the deal and he quarter-heartedly said it could be arranged. He was not the snuggly jokey kind of graffiti-artist bodyguard I'm accustomed to. Yeah, Futura had a bodyguard. I was also first in line, a line that I created. I started hitting on some of the models when my wife's cousin showed up Hispanically late. I was a little shocked she even showed at all. The dude behind me also helped me kill the 28 minutes by talking about Hennessy VS, his drink, on the rocks, never mix. The lady with him and I had a photo-off to see who could take the better photo, my iPhone v. her Samsung v. VS guy's iPhone. Yes, of course I won! Pardon how long this is before we even get to Futura, but the dude was not exactly prompt about showtime, at least 10 minutes late (to an hour-long gig). 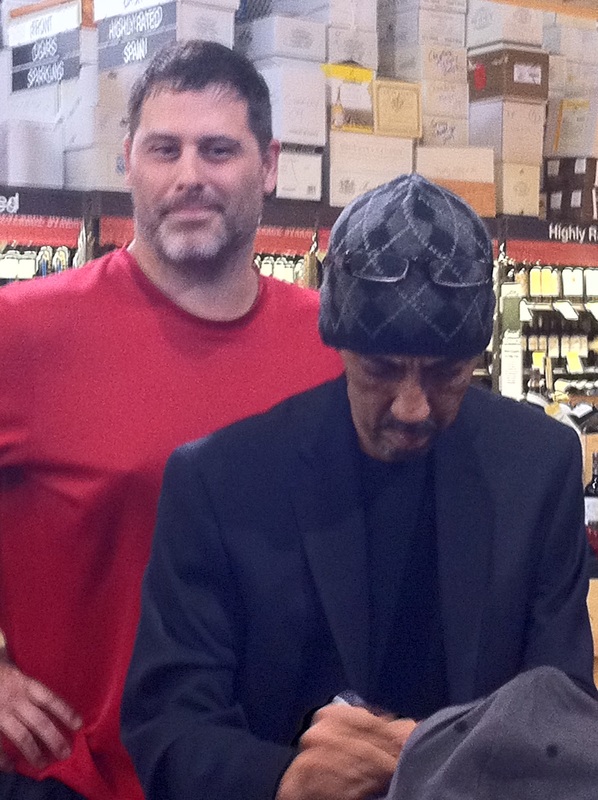 Anyway, when Futura was ready, he was escorted out by his security detail and led to a table surrounded by velvet ropes. And that's when the Hennessy VS began to flow as well. I personally just tried the cognac straight, pretty nice. The models were making and serving cocktails as well, and my cousin said that she really liked them. Since we were at the front of the line, we quickly stepped up and Futura signed our gear--bottle, gift box and my new Hennessy cap. There were some other photographers there trying to make a buck as well. Unfortunately, I couldn't find any Futura photos on either of their websites. Not really that good for business. And that's it. 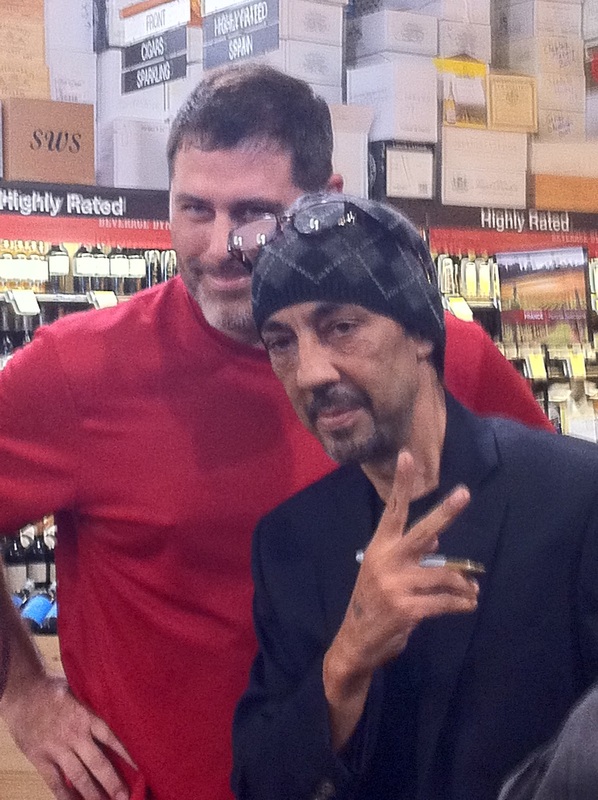 Except for the Total Wine Cashier that told me I needed to pay for the bottle before having it signed. How do you think that conversation went?